I have probably made hundreds of cakes in my life. And this is the first one I think of, the one I always keep going back to. It’s a family favorite that we have been making over and over for generations. Sunday night get-togethers with my grandparents and aunt and uncle often feature a wacky cake. My mom and grandma used to top it with what they called Egyptian frosting, a sour cream-based sauce with raisins, topped with unsweetened chocolate. Wacky cake is a staple at church potlucks. It’s an unfussy crowd-pleaser that doesn’t take a lot of time or cost a lot of money. In fact, the entire recipe costs less than $1.50 to make. Why Is It Called Wacky Cake? My best guess is because it’s egg-less. The recipe dates back to the Depression era, when supplies were tight. It calls for mostly basic kitchen staples that you probably have stocked in your kitchen. 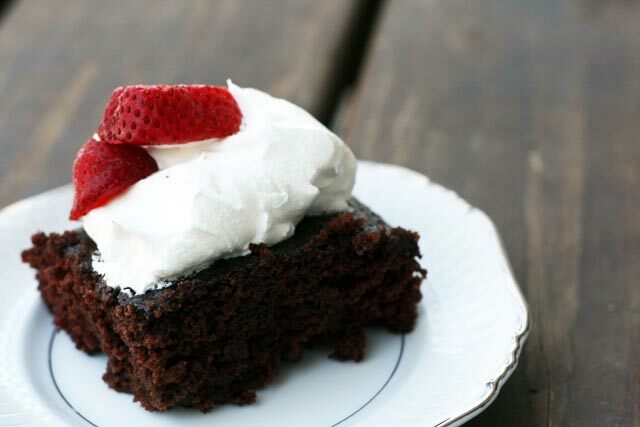 I’m not exaggerating when I say this is one of the best, fool-proof chocolate cake recipes out there. Looking at the list of ingredients, this may be hard to imagine. It’s egg-less and calls for vinegar. There’s nothing fancy about it. But you’ll have to trust me on this. This recipe is easily halved. Just use an 8 x 8-inch or 9 x 9-inch cake pan. Otherwise, for the entire recipe printed below, use a standard 9 x 13-inch cake pan. Preheat oven to 350F. Grease and flour a 9 x 13-inch cake pan. Combine dry ingredients into a bowl and make a well. Mix liquid ingredients together and pour into the well. Stir together until batter is smooth. Bake cake for 35 minutes, or until center is set. I made this over the weekend (with a few modifications) and it was delicious! Instead of chocolate, I used carob powder; and I subbed one cup of coffee for one cup of water. Also used whole wheat flour. The cake was super moist and fudge-y and so, so good! You really can’t taste the vinegar once the cake is baked. It’s just used to help raise the cake. However, I suspect lemon juice would work in its place. If you try this, please let me know if it works! My dad signed up for a men’s baking contest at church years ago. (Don’t ask me why.) Having never baked anything, he asked if I had an easy recipe. I gave him this one. After he found out he could “cook”, he ventured on to other recipes. Surprised us all! It’s a great recipe. Can you use it with something like coconut flour in place of the regular flour? Diabetic borderline but wanted to keep it low carb as possible. Also how do I substitute the sugar can you use Xylitol instead? Personally, I’m not a fan of coconut flour and can’t imagine it in this recipe. You could try einkorn flour, which usually tastes just the same as all-purpose flour. Or do a combination of APF and coconut flour – but using slightly less of the coconut flour because it’s more absorbent. As for the Xylitol, never tried that either. If it’s a 1:1 sugar substitute, give it a go! I’ve never tried olive oil in this cake, but I’ve tried it in other cakes and it usually produces more of a crumbly cake. You could certainly try it.. or try using a combination of olive oil and canola oil.